Asparagus Casserole - Home. Made. Interest. This easy Asparagus Casserole is a creamy, cheesy mix of eggs, cheese sauce, and fresh asparagus. It’s a simple spring casserole that makes a delicious side dish for Easter dinner or a spring brunch. 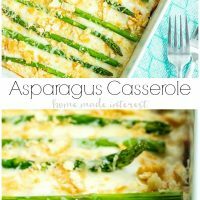 I love classic casseroles and this Asparagus Casserole was one of my great aunt’s favorites. She loved bringing it for Easter dinner and this year I decided to give it a try myself. 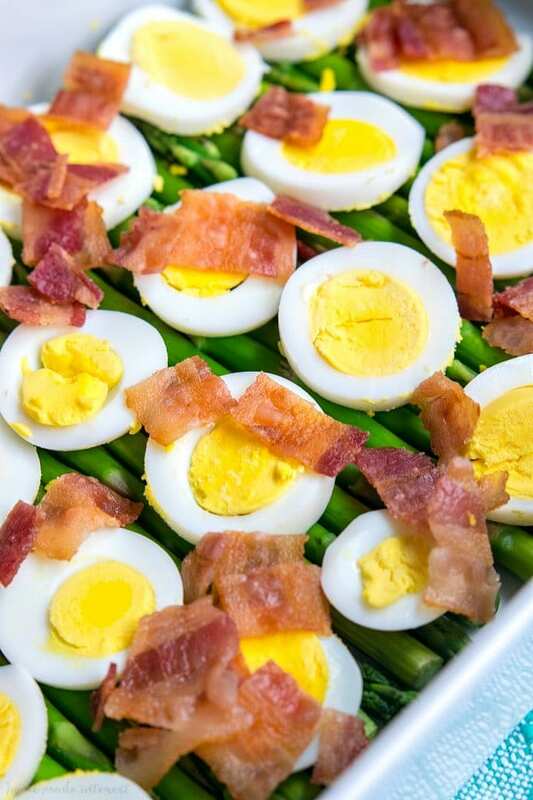 It’s a delicious combination of all sorts of yummy spring ingredients like hard boiled eggs, and fresh asparagus, mixed with crumbled bacon and covered in a creamy, cheesy sauce. The final touch is a sprinkling of crumbled RITZ crackers, a classic southern casserole topping. I’ll admit when I first looked over the recipe I wasn’t so sure about the hard boiled eggs but they totally work! Thinly slice the hard boiled eggs and place them on top of a layer of cooked asparagus. Chop up some deliciously salty, smoky bacon and sprinkle that over the eggs and asparagus. Make a cheesy bechamel sauce by cooked milk, flour, butter, and Gruyere cheese together into a thick, creamy sauce. Pour the cheese sauce over the asparagus, eggs, and bacon and then top with more asparagus and some crumbled, buttery RITZ crackers. Bake at 350 degrees F for 20 minutes until the sauce is bubbling. This is my easy tip for quickly steaming your asparagus. Wet a paper towel with water and wring it out so that it isn’t dripping. Wrap the paper towel around the asparagus bunch and place in microwave. Microwave for 2-3 minutes depending on the strength of your microwave. When it comes out of the microwave it will be perfectly steamed. Softened but with just a little bit of a bite to it. If you would prefer not to use the microwave you can always steam the asparagus the traditional way with a pot of boiling water on the stove top. When it comes out of the oven the asparagus is perfectly tender and stands out bright green against that cheesy sauce. It just scream spring. And that first bite, with the egg, bacon, and asparagus smothered in that rich, cheesy sauce and little buttery bits of RITZ crackers. Yum!! This is one of those classic side casserole recipes, like green bean casserole, that is just made for feeding friends and family. 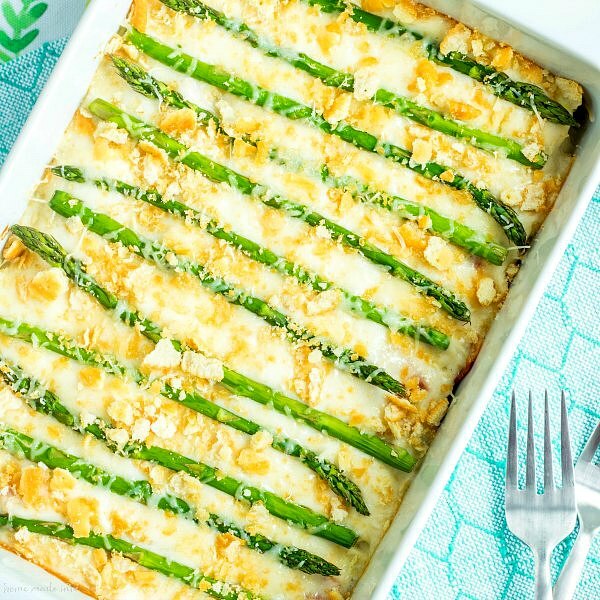 Make sure to add this simple, delicious, Asparagus Casserole to your Easter dinner menu! Want More Spring Side Dish Recipes? Trim the asparagus ends. Divide into two bunches and wrap each bunch of asparagus in a wet paper towel. One at a time microwave the asparagus bunches for 2-3 minutes (depending on the strength of your microwave) until the asparagus is tender but still has a crunch to it. Place the asparagus in the bottom of a 9 x 13 inch casserole dish keeping about ¼ of it aside for the top of the casserole.. Thinly slice the eggs and place them on top of the asparagus. Sprinkled with chopped bacon. In a medium saucepan, over medium high heat, melt the butter and then quickly whisk in the flour to make a roux. Cook for 1-2 minutes, until the roux turns a light golden brown and then whisk in the milk and water. Continue whisking until the mixture is smooth. Add the salt and continue to cook until the sauce begins to thicken, 5-7 minutes. Add the cheese continue to stir until it is fully incorporated. Pour the sauce over the bacon, eggs, and asparagus. 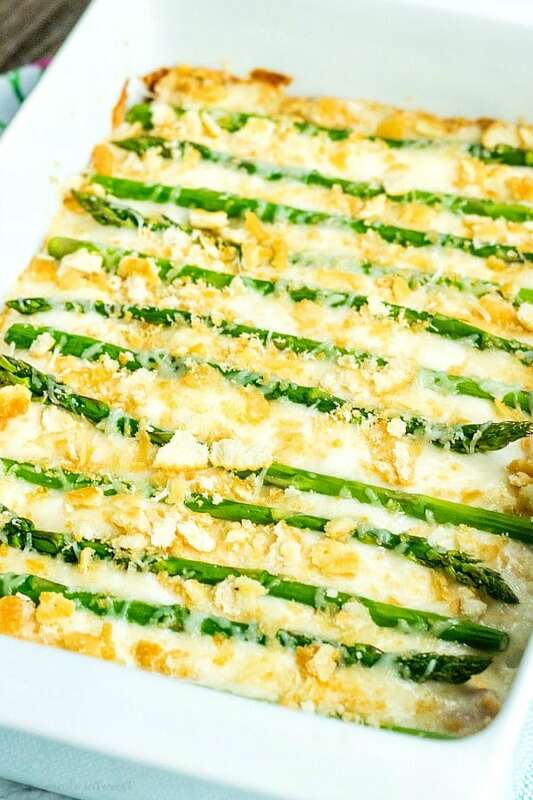 Place the remaining asparagus on top of the sauce and sprinkle with the RITZ cracker crumbs. Place in the oven and bake for 20 minutes or until the sauce is bubbling and the cracker crumbles are lightly browned. Update: This post was originally published on 3/9/2018 and was updated with a video on 4/15/19. Oh my word, what a delicious recipe! And it’s so beautiful too! Pretty sure this is fast becoming my husband’s new favorite dish! Asparagus is one veggie I know my kids will eat! I love that this is a casserole! Yum! Yesterday I made this beautiful asparagus casserole for Sunday brunch. It was fabulous! I loved how quick and easy it was to assemble, and the absolutely flavorful outcome. This looks amazing! I never would have thought to combine these ingredients together but seeing this recipe I can almost taste it! I love gruyere cheese and never know how to use it.